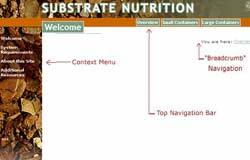 This Substrate Nutrition site is intended to be an instructional resource for growers interested in determining the properties of a given substrate. By providing information and multimedia materials to help clarify the process, it is hoped that you will be able to more effectively manage a plant's nutritional needs. This site is divided into three main sections. The first section, Overview, provides basic information that you should know in order to take the greatest advantage of the content available in this site. The second section, Small Containers, offers knowledge regarding the procedures required to test substrates for containers that are easy for someone to lift or move. The final section, Large Containers, offers content pertinent to containers that are not easy for someone to lift or move. You can create your own path through the site by moving through the modules in the top navigation bar. Within each section, you will be provided with a contextual menu on the left hand margin, which delineates the contents of the module. You can also choose to move sequentially through the site by clicking on the NEXT link at the bottom of every page. There are breadcrumbs (i.e. links that trace your steps back to the homepage) visible at the top of all the pages, providing you with your exact location within the site.